As my Perpetual Employee of the Month, Fluffy is responsible for entertaining me, as well as for feeding me and clothing me and doing everything else you would expect from the conscientious employee he is. 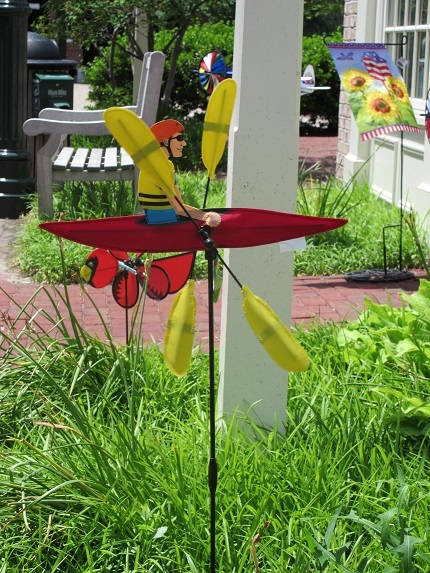 So when we were in Williamsburg, Virginia, last month, I was not a bit surprised when he packed me up one sunny morning and announced we were heading out for a day trip to the historic village of Yorktown. 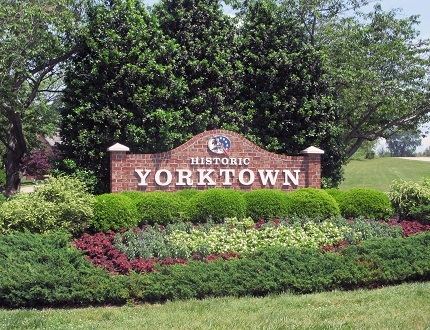 We had been to Williamburg and Jamestown, but had never been to Yorktown (the three cities are known as the Historic Triangle because of all the important historical stuff that happened there). You can hardly blame us. We have only lived in Virginia since 1987. We just hadn’t gotten around to it yet. But Fluffy had done enough research to see pictures of it, and to know that it was a scenic drive. That was good enough for him. He packed my wheelchair in the backseat and I threw my trusty purple camera around my neck, and off we went. Sure enough, the scenic drive was — well, scenic. We started finding pictures to take around every corner. Sometimes we didn’t even have to turn a corner to find a picture — that’s how photogenic it all was. 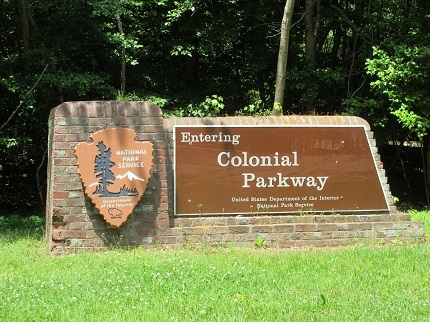 When you see a sign that says you’re on a parkway that’s maintained by the Department of the Interior, you know you’re in for some scenic stuff. 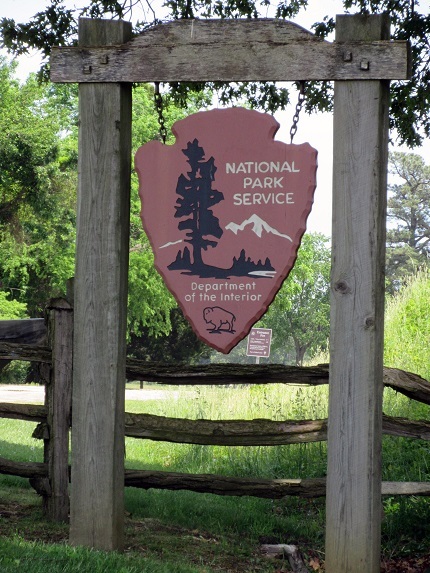 We were ready for bison, even if only viewed on Department of Interior signage. 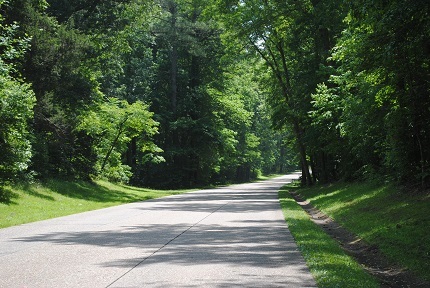 Everywhere we drove, the trees provided shade that was cool and inviting. The road was so peaceful that we wanted to enjoy the view. Part of it had such heavy undergrowth that it looked like the forest primeval, but we couldn’t stop to take pictures of it because there were people behind us that wanted to get past us now. We were driving the speed limit, but that was not fast enough. If we had been driving twice as fast as we were driving, it would not have been fast enough. 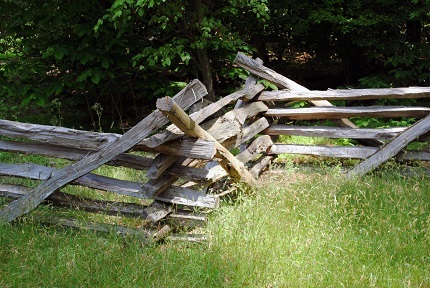 We saw many split-rail fences like this one lining the roads. If George Washington ever built a fence, this is the kind of fence he would have built. 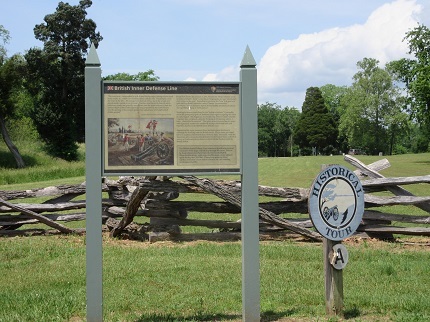 Eventually we got to the village of Yorktown. To my surprise, Fluffy didn’t even go to the visitors’ center. As it turned out, this was a good move on his part, because tickets cost $16.75 per person, and there’s no way we could have afforded it. Not this year! Maybe we’ll go back next year, when I’m out of debt and we are solvent. This is the sort of thing I expected to see on our trip. No, sirree. After stopping to take this lone picture, Fluffy drove right to the waterfront. He knew what he wanted to see. The waterfront, Fluffy’s destination, was scenic, and it was free. When we got to the waterfront, Fluffy got me situated in a breezy spot in my wheelchair. Once he made sure I was comfortable and happy, he went off to take pictures and left me to take pictures of my own. We each had a fabulous hour doing what we loved. If we’d shelled out the money to go to the visitors’ center, we probably would have known the significance of these two ships. 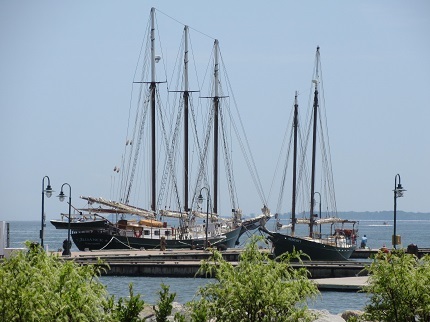 All I can tell is that by the rigging they appear to be pretty old. Here’s George Washington with his hand out. Apparently he wants what the other guy has behind his back. It sure would have helped if I had read the plaque to see who the other guy was and what was going on. Before you think that Mr. Washington had terminal acne, the other guy’s face was just as bad. Apparently this was some artistic technique on the part of the sculptor. There were all sorts of fascinating shops and restaurants in the vicinity. Sigh. Maybe next year. 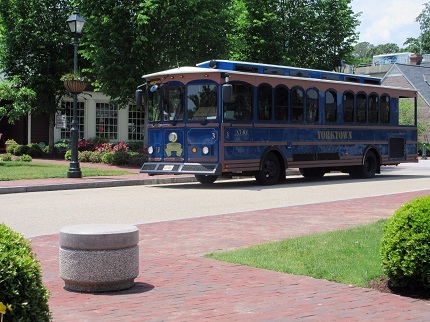 There was a brightly-colored trolley that went from the waterfront to the historic area. You could just hop on and hop off as you wished. I did not try hopping on. Hopping is just a wee bit problematical in a wheelchair. After we left the waterfront, we went through the town and then got on the parkway again. We could have taken the highway back home. In fact, we crossed right under it. But why take the highway when we could take the scenic byway instead? Photographs awaited us, and my trusty purple camera was in my hands. 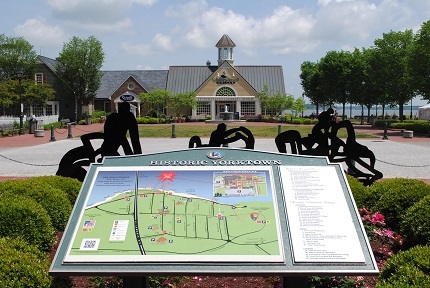 Fortunately, we did not have to pay the $16.75 per person to take a picture of the Yorktown village sign. 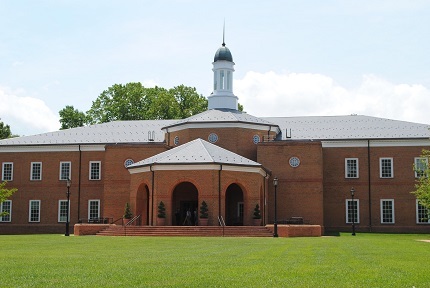 We also did not have to pay $16.75 per person to take a picture of the imposing Yorktown courthouse, so that’s what Fluffy did. Once we were back on the parkway, we were ready for moose or bear or anything. Unfortunately, all the paid moose and bear are assigned to Yellowstone and other national parks that are cooler. They would swelter to death in Virginia. We have to be content with mangy deer, and we didn’t even see any of those. 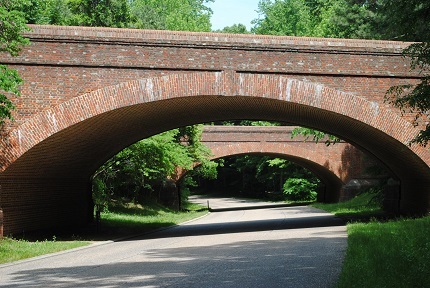 When you’re on a parkway sponsored by the Department of the Interior, you don’t just get one scenic overhead bridge — you get two at a time. What I want to know is this: Do all husbands do the motormouth when they are walking? I suspect they do. 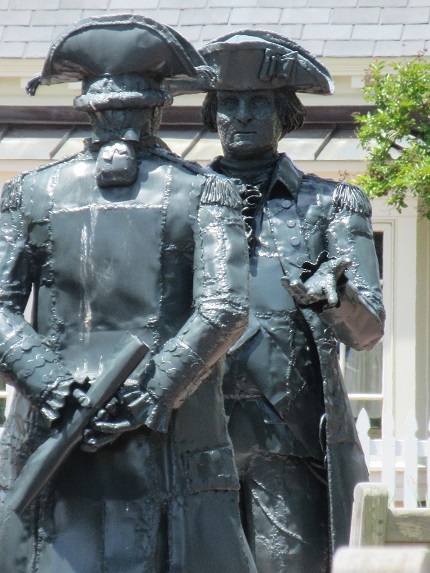 In fact, I suspect that if the sculptor that did the statue of George Washington and his nameless antagonist at the Yorktown harbor would have been realistic, he wouldn’t have given them acne. He would have had them both doing the motormouth at each other. We had a glorious time driving along. The only problem was, even though we always went the speed limit, we kept collecting a parade of cars behind us that wanted to go twice as fast as we were going, and who were more than a little unhappy that we were poking along so slowly. I cannot blame these people. They were probably natives of the area who were just trying to get somewhere. They had probably seen the magnificent scenery hundreds of times, and paid little attention to it. They just wanted to get where they were going. That being the case, I cannot understand why they did not just take the highway. Every time that Fluffy was able to find a pull-out in the road, he pulled off and let the parade of cars behind us pass us, and they zoomed by. I hope they were able to refrain from giving us one-finger waves when they did so. (We didn’t look to see.) No doubt they thought we were stupid old people, and that we should have stayed home slurping our oatmeal. I know what they were thinking because Fluffy and I used to be among the young people zooming by. We could not understand why the stupid old people only went the speed limit when they could easily have been going faster than that and reaching their destinations hours earlier than they were going to get there. 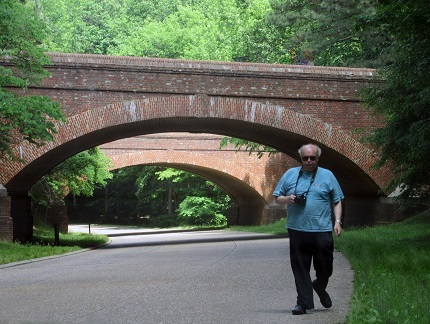 I can tell you that none of the people who passed us had purple cameras around their necks, and none of them were stopping to take pictures of the double bridges or the split-rail fences. We even turned around to get a shot of a great blue heron that was sitting on a post in the water, but he flew away before we could get the shot. I’m betting the speeders never even saw that magnificent bird. When we are young, we think the object is to hurry, hurry, hurry, hurry, and hurry some more. It is only when we get older that we realize we are all too quickly going to reach that final destination. It is then that we stop to look around and see the things that God has put here for us to enjoy. Have we reached our quota of sunsets? Have we enjoyed enough bends in enough rivers? Have we seen enough waterfalls or listened to enough thunderstorms? Have we eaten enough warm chocolate chip cookies? Have we spent enough time with the people we love the most? These are questions that do not bother us when we are young. When we are young, we think there will always be time. When we are older, we realize that clocks run down and that time is running short. It is only then that we want to see everything we can. We do not want to miss the beautiful things that God and nature — and even the hand of man — have provided us. So when Fluffy packs me in the car for an adventure, we savor every minute of it, and to heck with the people who are lined up behind us on the road. If you happen to find yourself behind two geezers in a gold Mercury Sable, and there is not a pull-out so we can let you pass, I’m afraid you’ll just have to slow down and enjoy the ride.